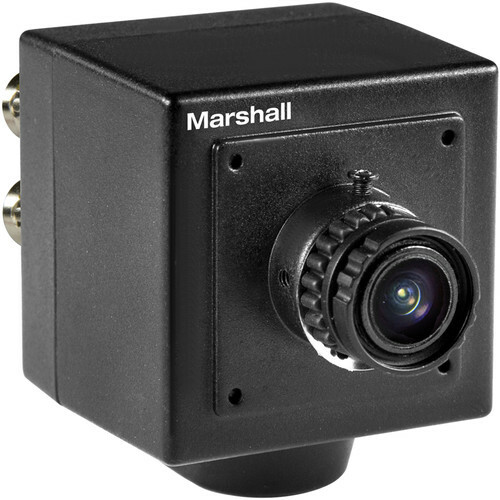 Suitable for use in various broadcast situations as well as security applications the Marshall CV502-MB 2.5MP HD/3G-SDI Compact Broadcast Compatible Camera with Interchangeable 3.7mm Lens provides HD video in a small form factor. The camera features a 1/3" CMOS sensor and includes an interchangeable 3.7mm lens in an M12 mount. The camera captures HD video at 1080p 29.97/59.94, 1080i 59.94, and 720p 59.94 fps, allowing you to easily integrate the camera into an infrastructure that supports Broadcast frame rates. The camera incorporates one 3G/HD-SDI output as well as a CVBs (composite) video output.